Bone spurs are often referred to a osteophytes and can form on any bone, joint, ligament or tendon in your body. According to MayoClinic.com, most bone spurs are not painful, but bone spurs might rub on neighboring bones and nerves, which can result in pain. Many bone spurs go asymptomatic for years. If you do experience pain, several treatment methods can be used, one of which is vitamins, a form of alternative medicine. Consult your doctor prior to beginning any vitamin regimen for bone spurs. Familiarize yourself with the symptoms of bone spurs. Joint pain and loss of your range of motion are common indicators of bone spurs. Consult your doctor. Receive a confirmed diagnosis of a bone spur. Discuss the possibility of vitamin supplementation with your doctor for healing your bone spur. Consume vitamin D to help reduce your bone spur. 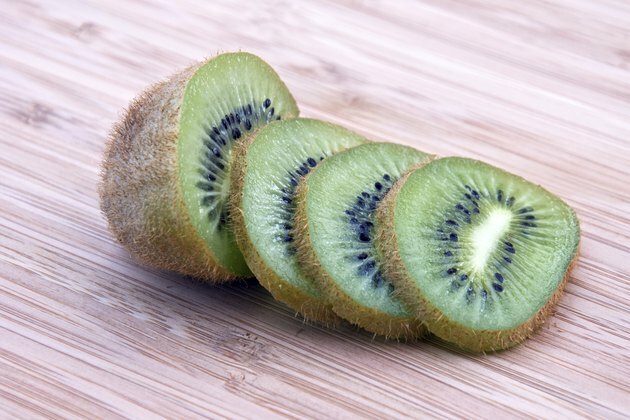 According to "The Vitamin Book," fortified milk is an excellent source of vitamin D. Consuming one cup of milk each day will provide you with 30 percent of your daily allowance of vitamin D.
Take a vitamin E supplement or consume vitamin E through green vegetables, whole grains, soybean oil, tomatoes, mangoes or kiwi. "The Vitamin Book" says adults over the age of 19 should consume 1,000 mg per day. Vitamin E can help reduce inflammation caused by bone spurs. Increase your intake of vitamin K. Take a supplement or consume vitamin K through green vegetables, such as cauliflower. "The Vitamin Book" says a lack of vitamin K can result in abnormal bone and cartilage mineralization. This can lead to the formation of bone spurs. Adult males -- 19 and older -- should consume 120 mcg per day. Adult females should consume 90 mcg per day. Take magnesium and calcium supplements. These supplements can help provide relief from the pain of bone spurs. According to Arthritis Treatment and Relief, 1,200 mg of calcium and 600 mg of magnesium should be consumed daily for bone spurs. Consider conventional treatments. If vitamins fail to eliminate bone spurs and pain, make another appointment with your doctor. Consider treatment options, such as medication to ease pain or surgery to remove the bone spur.